This is the second knife issued to Gurkha Soldiers. It is the dressed knife worn only on special occasion and therefore the name and the quality. The scabbard is made of best quality pattern leather to give extra shine and smartness to the uniform. Gurkhas carry this khukuri on events like ceremonial khukuri drill presented before high-ranking military officers or VIP dignitaries. During the presentation they withdraw the khukuri from scabbard and hold it out for guest inspection. The blade is also skillfully crafted and recruitment date of each soldier is engraved. 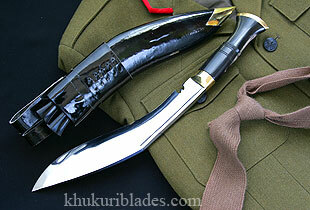 A soldier retains this khukuri throughout their army career and is a prize possession after retirement. Twin belt stripes are fitted at the back portion of its scabbard.